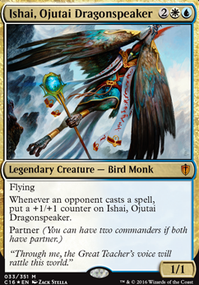 I have been brewing a deck for a while based on the Helm of the Host / Timestream Navigator combo, but while there are definite similarities, there are also major differences. I don't know if any of my ideas will be helpful for your deck, but maybe something will work for you. The big difference is I have splashed red, primarily so I can include Rhythm of the Wild . First, it allows you to give your Navigators haste so you can, in a pinch, drop one and use it immediately (which is also necessary when used in an alt combo discussed below). 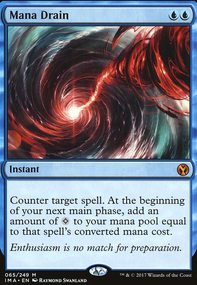 It also prevents your creature being countered which boosts the effectiveness of Frilled Mystic s--they will counter a spell...unless your opponent casts an enchantment burner as well as their own counterspell. Finally, giving haste or +1/+1 counters can beef up your mana dorks, make them usable the turn they are dropped, or in the case of the Incubation Druid automatically give them the tap-for-three ability. Because I am playing Vannifer, I have a much higher percentage of 1 cmc creatures. Even without Vannifar, this could be helpful because it helps you Ascend faster, plus some of the creatures have an additional use. Siren Stormtamer is a cheap flyer that can also help protect your creatures when you start to activate/cast your combo. 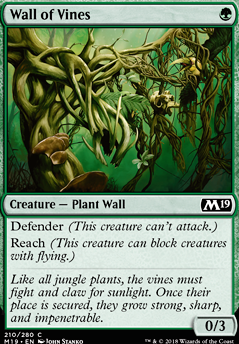 Wall of Vines gives you some protection vs weenie and token decks. Fanatical Firebrand (if you are playing red) is early damage and can take out key weenies. Benthic Biomancer can draw cards. Sparring Construct becomes a +1/+1. Get a Beast Whisperer in play and you can really burn through your library. A few question I do have for you...What percentage of the time do you pull off the combo? How often do you cast the heavies before the combo? If you have few pre-combo heavies, you could maybe thin them a bit in favor of some counter magic and/or green removal or graveyard retrieval. One final suggestion: Siren's Ruse . It can save a key creature, can double your Mesmerizing Benthid illusions, and can make Frilled Mystic counter another spell. Good luck with your deck. It looks very viable now and has certainly given me things to think about for my still-brewing monstrosity. Nice list. I like Wall of Vines over Portcullis Vine for the Reach. Druid of the Cowl might be better than Saruli Caretaker (admitted flavor loss due to not being a Defender), and perhaps a few copies of Suspicious Bookcase over Wall of Mist . A one of Dovin's Acuity could help with card draw as well. Goof luck! BaneOfLordran I like the deck changes. I'm glad you liked cutting red. I am having enough consistency issues with my Arcades deck in bant colors. I am almost all blue/white in that deck besides splash of green for arcades. My first thought to make the deck more competitive is you have many 1-2ofs and so few 4ofs. This will impact your consistency. Take the rest of these suggestions with a grain of salt. I find the best way to narrow my deck down to consistent 4ofs is to play the deck with many 1-3ofs and see what cards I like and what I don't. Now for cards like Azor or Teferi, 1of is probably correct. I think you should cut Overflowing Insight for more Patient Rebuilding. Rebuilding enters the game faster and combos very well with Psychic Corrosion. 4 Diligent Excavator seems correct although it is not historic nor a defender. I would recommend a tad more removal to help you get to late game. Cast Out is great for maintaining instant speed or more Seal Away or perhaps Baffling End. Sai, Master Thopterist has been only ok in my deck. It may be better in yours with instant speed draw card ability. Wall of Vines might want to be replaced with Novice Knight. It is also a 1 mana defender that loses reach but gains two power which makes him a much scarier blocker. It depends on your local meta as far as how often you will be against flying creatures. I think I'm going to buy the pieces and morph my Arcades deck into yours. I do not have a Teferi online but two Azor will do fine. I like how it will survive the Kaladesh/Aether Revolt rotation. That was a requirement when building my Arcades deck. Keep playtesting and tweaking! 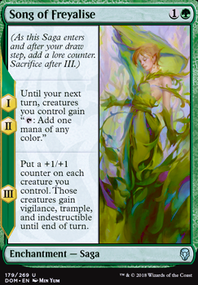 WItC on Budget Beginner Teach Decks (#1 Green) w Puzzles! Thank you Frewsax for the interest in in the deck! 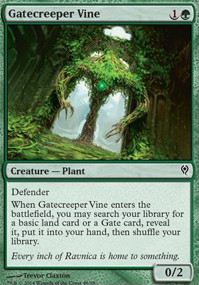 Wall of Vines is thematically a very "green" card, but there are reasons why I would not use it in this deck. We are mainly trying to ramp our mana, in order to cast our big creatures as quick as possible. We do have low CMC creatures, that serve to block the opponent in the early phases of the game. However, they also serve key secondary roles, either as ramp or as card draw. In short, the wall just doesn't do enough. Also, Archweaver stabilizes the board in the later game when we can play it, and it is one of our main win conditions. Without the spiders, we would struggle once we got to the late game. Of course, please experiment with the deck freely. The decks are designed to introduce people to the game, and experimenting with deck building is a fun part of the MTG experience.